An overview of the WSDL specification. A WSDL is an XML-based specification that serves to describe and define web services. It is commonly used to describe SOAP-based web services. A WSDL defines an abstract definition (logical) and a concrete definition (implementation). The use of an enumerated type for the currencies in question (from and to variables) has been omitted for simplicity. Type definition: The definition of types to be used during data exchange. Interface definition: The arrangement of such types into logical operations that contain inputs, outputs and faults. Types are not necessarily defined within a WSDL xml document; XSD files may be referred externally using include directives. Organisations that attempt to define a canonical object model often follow this practice. At the top level, an interface defines a collection of operations and faults. Faults, in turn, can be referenced within operations. Whereas inputs and outputs are bound directly to types, faults need to be declared separately and then referenced indirectly. The reason why faults are declared independently is that they can be referenced outside of the “operation context” as general, global exceptions. 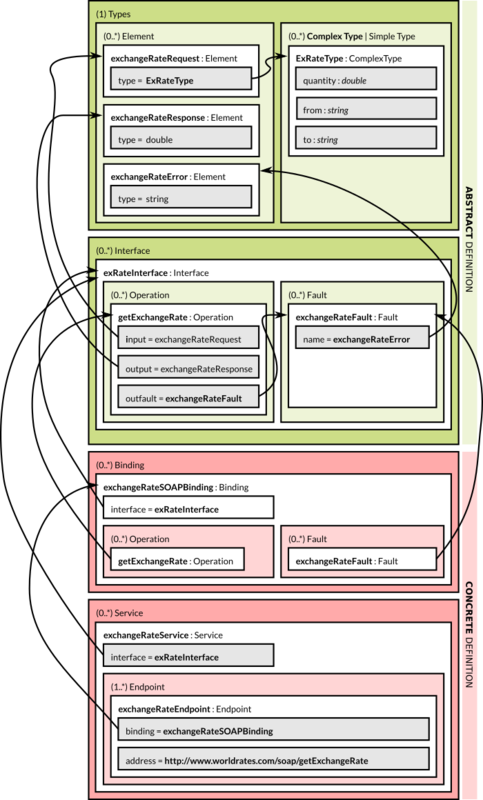 Binding: Associating the interface (operations and faults) with a specific transport type such as SOAP. Service declaration: Establishing the physical location (endpoint) in which the bound interface can be found. Operations are defined by associating inputs and outputs with types and faults with declared faults within the same <interface> block. Document-style is the property of an interface that is message-centric as opposed to method-centric. A message-centric interface allows multiple request/response messages to be provided in a single interaction. A method-centric interface (RPC-style), instead, simply projects a standard programming function—that consists of fixed parameters and a return value—over the network. In the above example, we show how a series of RPC-style services are refactored into a document-style JSON service. A key aspect to consider regarding the getAccountDetails service example is that it may accept either just one account-related request or multiple ones. It should not be assumed that the actions attribute expects only a fixed structure consisting of creditCards, creditScore, and accountBalances. It may only take, say, creditScore, and/or other types of actions to be developed in the future. In abstract terms, document-style messaging is a design pattern similar in spirit to that of the Command Pattern in OOP. In concrete terms, and in SOAP 1.2 in particular, document-style is the default way of encoding documents, whereas RPC-style is supported as an extension mechanism. In SOAP 1.0, instead, the document and RPC choices are more balanced without either of them appearing to be the prevalent choice. It is worth considering that a document-style request will ultimately be processed by the equivalent of a programming function that takes parameters and returns values. Such a programming function has to decide what to do with each of the encoded documents or actions. Let’s suppose that the integration platform consists of an ESB that wraps “legacy” APIs using SOAP, and that the discrete functions getCreditScore, getCreditCards, and getAccountBalance exist on a platform called “Mainframe System”. The Mainframe System must be modified to implement a new function which may either act as a proxy towards the three discrete mainframe functions or it may implement the necessary business logic from scratch. The ESB must provide the capability to define a brand-new service that provides the necessary business logic to interact with the received “documents” so that discrete invocations to the Mainframe Account System may be produced. Unless some form of caching is in place, option 2 does not necessarily reduce latency—as per the provided example—since four invocations still take place behind the scenes for every single invocation to the document-style service. All pre-requisite data must be handed over in a single request. If the messages have inter-dependencies, in the sense that the output of a message is the input of another, then an additional request will be required to produce such data. In fact, in the provided example, we assume that the provider somehow already “knows” which are Zizek’s account numbers. The action chain in the above example would group two other actions and take the output of the first action (accountNumbers) into the input of the second one (accountBalances). Remote Procedure Call-Style (RPC-style) is the property of an interface that is method-centric as opposed to message-centric. A method-centric interface (RPC-style), projects a standard programming function consisting of fixed parameters and return values over the network. The RPC-style property is normally treated in the context of its opposite style; the Document-Style one.